To visit Weimar is to get at the heart of German culture. Since Johann Wolfgang von Goethe moved here in the late 18th century, this East German city has became a site of pilgrimage for the German luminaries. In the 20th century, Weimar was the cradle of the Bauhaus movement, which created a revolution in art, design, and architecture. The first Bauhaus school of arts and architecture was founded here by Walter Gropius in 1919. The list of former Weimar residents reads like the “Who's who” of German literature, music, art, and philosophy: Johann Sebastian Bach, Richard Wagner, Friedrich Schiller, Wassily Kandinsky, and Friedrich Nietzsche all lived and worked here. You can follow in their footsteps, literally. Almost all of Weimar sights and attractions are in short walking distance from each other and the landmarks touched by these German greats are well-marked. Weimar's Old Town: A great place to start is in Weimar's Altstadt. You'll see more than 10 historic buildings from the Classical Weimar period (1775-1832), which are UNESCO World heritage sites. Along your way are magnificent town houses, the royal stables, the neo-Gothic Town Hall, the Baroque Duke Palaces, and many more historically important architectural gems. 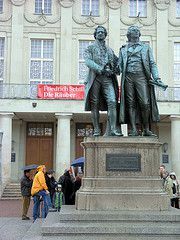 Theaterplatz: Meet the two most famous residents of Weimar, the German writers Goethe and Schiller. Their statue from 1857 on Theaterplatz has become the signature landmark of Weimar. National Goethe Museum: Johann Wolfgang von Goethe, Germany's most celebrated writer, lived for 50 years in Weimar, and you can step into his literary and personal world by visiting his Baroque home, complete with original furniture. Schiller House: Goethe's good friend Friedrich von Schiller, another key figure of German literature, spent the last years of his life in this Weimar town house. He wrote some of his master pieces, like "Wilhelm Tell", here. Weimar Bauhaus: Weimar is the birthplace of the Bauhaus movement, which created a revolution in architecture, art and design between 1919 and 1933. Visit the Bauhaus Museum, the original Bauhaus University, as well as various buildings in the distinctive Bauhaus style. Weimar Town Castle: The splendid building of the Town Castle houses the Palace Museum, which highlights European art from the Middle Ages to the beginning of the 20th century. Grand staircases, classical galleries, and festive halls make this one of the most beautiful museums in Germany. Duchess Anna Amalia Library: Duchess Anna Amalia was crucial in developing the intellectual zeitgeist of Goethe's Weimar. In 1761, she founded a library, which is today one of the oldest libraries in Europe. It holds the treasures of German and European literature and includes medieval manuscripts, a 16th century bible of Martin Luther, and the world's largest collection of Faust. Buchenwald Memorial: Only 6 miles away from the romantic Old Town of Weimar lies the concentration camp Buchenwald. During the Third Reich, 250,000 people were imprisoned here and 50,000 were murdered. You can visit various exhibitions, memorial sites, as well as the camp grounds themselves. Getting There: Deutsche Bahn offers direct connections from Berlin, Leipzig and Erfurt. Weimar Hauptbahnhof is about a kilometre from the city center. It is also connected to Autobahn A4. Find out more ways to reach Weimar by train, car, or plane. Guided Tours: You can take part in various guided tours through Weimar. Weimar is also on our list Germany's Top 10 Cities - Best Spots for City Breaks in Germany.